Travelling by bicycle is the best way to explore the culturally rich city of Galle and its rural hinterland. The advantage of cycling is that you get to cover more ground and see much more than you ever could on foot or in a car. Peddle your way along the quiet streets of Galle’s historic sixteenth century Dutch fort to experience the delights of this living museum; dart through the vivacity of Main Street to observe the colourful fruit, vegetable and fish markets; and escape out into the peaceful verdant countryside to visit the 300-year-old Buddhist temple at Yatagala, passing coconut palms, rural homes and endless green paddy fields on your way. The beautiful beach at Unawatuna could also be glimpsed on your picturesque route or chosen as a final destination so you can have a refreshing dip at your journey’s end. 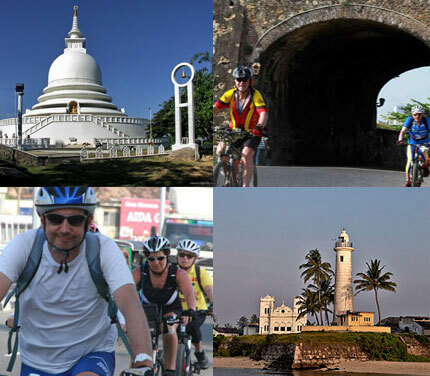 Another regional delight includes cycling up from Unawatuna through mystical Rumassala Mountain to the Japanese peace pagoda which has a magnificent position overlooking the sea. A visit to a low country tea plantation and tea factory will add more colour to your trip and here you’ll be able to enjoy a refreshing cup of pure Sri Lankan tea and experience first-hand how it was produced. If time permits, you could also witness the phenomenon of stilt fishing in Koggala which is a traditional method of catching fish endemic to Sri Lanka. Choose from an invigorating half-day tour or enjoy a full day out with our experienced local guide. The services of an experienced city guide. The hire of high quality, well-maintained mountain bikes. Drinking water during the trails. Lightweight clothes and biking shoes / boots should be worn on the ride. A walking tour of Galle Fort. Kottawa Forest Excursion and River Safari in Koggala Lake. Visit to the KDN Forest Complex. Whale Watching in Mirissa (November to April only). Trips can be conducted anytime however bookings should be made 2 days (48 hours) prior to the starting date/time.